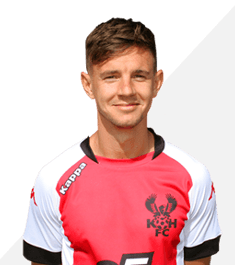 James Baxendale joined the Harriers on the eve of a friendly game against Aston Villa that would mark the beginning of the 2018-19 season. A youngster with Leeds Utd he left after one year of turning professional with them to join his hometown club Doncaster Rovers but failed to really make an impact there. While with them he went out on loan to various clubs before signing for Walsall where he, at last, began to get regular game time. After four seasons at the Bescot he left to join Mansfield town after spending a short while on loan with them. Six months after his arrival here he was sent out on loan to Nuneaton Borough even though he had played sixteen times for us and was the creative type of player that we were supposed to be recruiting rather than a bruiser. James left the club in February 2019 after his contract was cancelled by mutual consent so that he could join Nuneaton permanently.